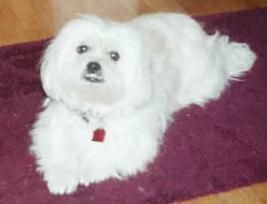 My Maltese Pekingese mix is a great dog. The best friend you can ever have. Extremely smart, active and affectionate. My Pekatese is around 1 year and half old. I had her since she was 2 months old. My pekatese is 3 1/2 months old. She is very smart. I taught her to sit in just a few minutes. She is very cuddly. Her hair seems to grow very fast. As a puppy she likes to play and bites me. But I give her a chew toy and she is easily entertained by that. She is adorable! 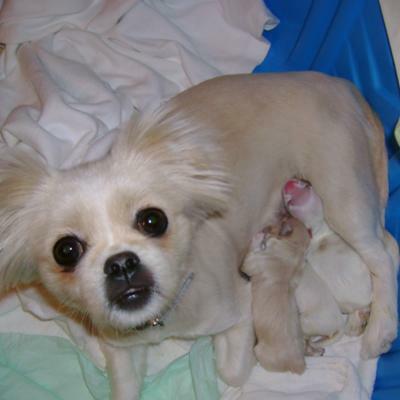 Mickey is a Maltese Pekingese mix. He is so loving and loyal and a good watch dog too. He was 7 years old when this picture was taken and is 12 years old now. He is still very active and loves his pupperoni treats. Two Paws UP! for Mickey! 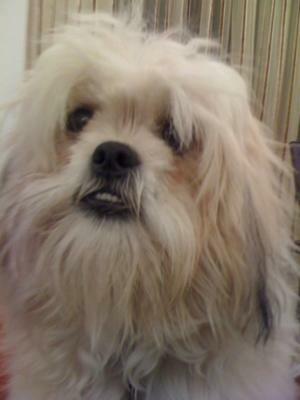 I just lost my wonderful Maltese Pekingese mix (I've always called him a Maltapeke). He was 12 and developed Cushing's disease about 2 years ago. He was such a sweetie. He got along with children, dogs, and later in life even cats. He was fiercely loyal and always in the room with me wherever I moved throughout the house. At one time, I also had his sister Abbie. Now, she was something else. She thought the world revolved around her and only who she says could come into the house were welcome. But, Cody was different. He would always bark when someone rang the doorbell or came into the house but would quickly calm down. He would also bark if he had to be on the "wrong" side of the fence from you. They want to be right with you at all times. He was a wonderful dog and so beautiful. 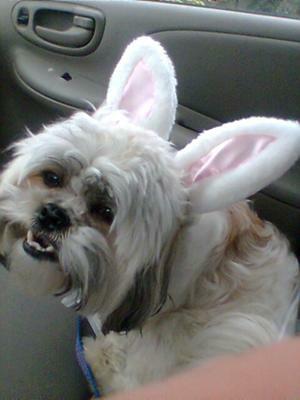 We miss our Maltese Pekingese mix a lot. 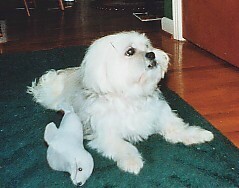 I am so sorry for the loss of your sweet Maltese/Pekingese Cody. He is so cute. 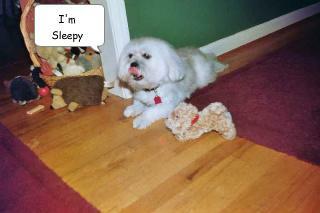 We have a white Maltese/Pekingese named Mickey. He will be 14 in Sept. and has some medical problems but is doing okay. 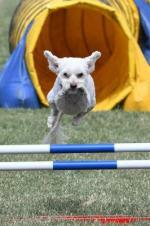 Our Maltese Pekingese mix is smart like her mother. So loving and likes to cuddle. 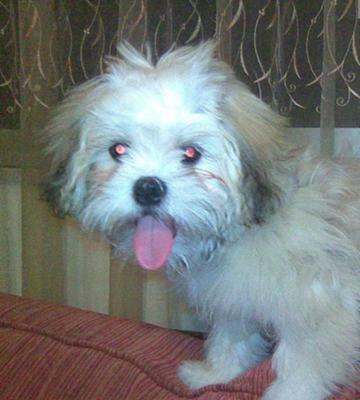 We mated her with a pure bred Maltese she's half Maltese half Peke. She had three puppies, one girl two boys. They are 4 days old. She's a good mom. So much fun. Thank you little miss Muffit.Hope to put up more pictures when they start moving more. She is an 8 week old Maltese Pekingese mix adopted Friday, March 5,2010, for our twins 7th birthday. Our beloved 14-year-old daughter, Natalie, passed away following a year of cancer treatment for Ewing's Sarcoma, one of the rarest of all pediatric bone cancers, due to a lung infection. She cancer free at the time of her death, but died following a 7 week battle with an unknown lung infection which eventually destroyed her lungs, and her life. She was only two treatments away from completing her chemotherapy regimen. The autopsy could not reveal a cause, but for sure they said she was cancer free. Last March, before Natalie had her surgery to remove the originally infected bone (which must always come out) which involved her left pelvis, her entire hip, and her femoral ball head, Natalie had an outing with me and the twins, who were about to turn 6. Natalie had only 2 public outings in one year, as her case was so serious and she was so fragile, so this was special. So this past week, the 6 month marker following her death, my husband and I decided to get a puppy, and stumbled upon this adorable Maltese Pekingese. And we all hit it of instantly. In the one day we have had her, she has brought a bit of joy, and new life, to a family, our family, though nothing can replace Natalie, we feel like this is her puppy, her gift to us. Mazda is the greatest, and is a wonderful, kind, funny puppy with an amazing personality and is a quick learner. We love her to pieces already! 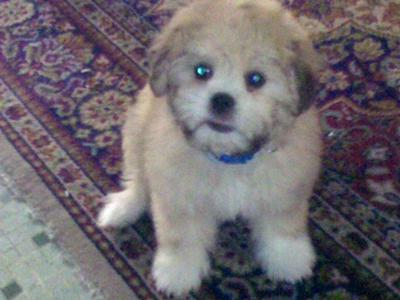 We are in the process of adopting a 10 week old Pekinese Maltese mix. He is adorable and stole my heart the very minute I saw him. The final part of the process is making sure our current dog gets along with the puppy. She better be on her best behavior when we take her to meet her new little buddy on Sunday. May your heart continue to hold the joy that your daughter brought into your lives. I hope that Mazda continues to brighten each day for your family. I am so sorry about the loss of your precious daughter. Nothing can hurt more than losing a child. Thank you for sharing it. There is something very special about these little dogs. Our Muffit is Yorkie/Maltese. And it seems when you mis with the little Malteses, the dogs turn out really adorable in looks and personalities. They steal your heart away. We hope you have many years of joy from Mazda!! 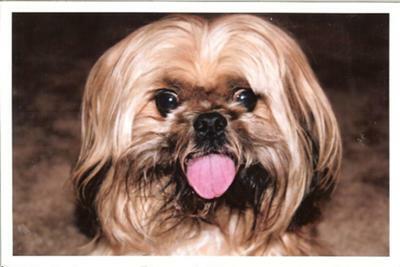 Mickey our Maltese Pekingese mix had his 14th birthday Sept. 20, 2010. As I have said before he has a heart murmur and gets out of breath easily. That causes him to cough. Otherwise he is doing well. This breed of dog is very loving and adapts well to the household routine, also a good watch dog. 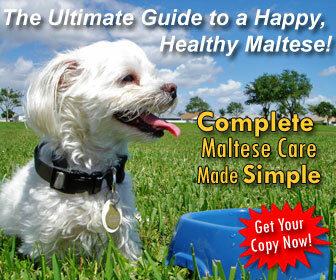 I think all the Maltese and Maltese mix dogs are so cute. Charlie will be 2 in July. 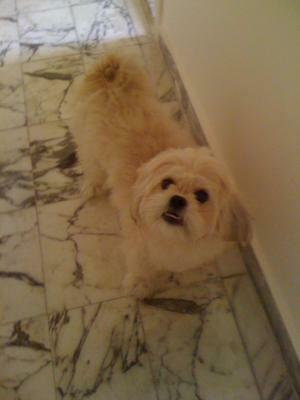 Our Maltese Pekingese mix is the most loyal dog I have ever met. He would rather be by your side then get a treat or play. He absolutely loves kids and other dogs. He was raised around a golden so he just runs up to any big dog and expects to play. He was hard to train as a pup but very worth it. Charlie is a very interesting mix. 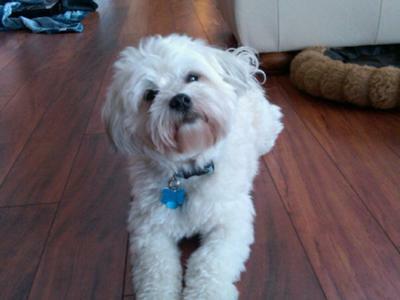 He doesn't look like other breeds necessarily and is three fourths Maltese and one fourth Peke. I absolutely love Charlie and he has quite the personality. Loves to lay upside down in my bed and cuddle. He loves to play with stuffed animals and cuddle. He is also a very social dog and loves going to the park and seeing his friends. He is the most loyal dog I have ever owned and a great companion. Not much phases him and he is relatively calm. 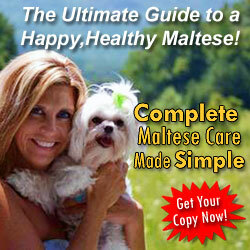 I would definitely recommend Pekingese Maltese mix dogs! 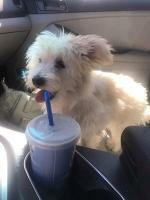 Biscuit is a silly clown Maltese Pekingese Mix. He weighs 8 lbs and is 11 months old. He is white with black undercoat on his ears, with shades of brown on his back. He has somewhat curly hair and a pretty poofy white tail. He loves to snuggle and gives hugs when I hold him up to my shoulder like a baby. He also likes to play chase with my cats and 8 year old boy. When Biscuit gets wound up playing chase the fun begins. The cats can be done and the boy can be winded and out of breath but Biscuit will run around the house and dart towards the others with a big smile on his face enticing them to play again! He also will walk on his hind legs, hop and turn in circles for a milk bone. He rarely bark and makes the silliest little almost robotic purring sound for a whine. He loves his bath and loves to be brushed. He smiles and prances around after he's all clean and fluffy. He has been hard to house train, lifting his leg on things and leaving little tootsie rolls here and there. I take him out up to 8 times a day but he rarely poops outside. I can have him out for 15 minutes where he will sniff and mark here and there but comes back in the house to poop! My former experience was always with big dogs, Rottweilers and Labs. My Pekingese Maltese mix Biscuit is far more personable than the big dogs, having a friendlier more "human" personality but the big dogs were far far easier to potty train! Dusty is the sweetest dog that I have ever owned. He is a Maltese Pekingese mix and the first small breed that I have ever owned, but I was in a pet shop and every time I would walk by him he would bark at me. Of course that got my attention. I bought him and have never regretted it once. He is the king of this house. He loves his toys but he doesn't mind sharing with other dogs. At night he sleeps with my boys and if for some reason he is left out of their room he will sit at their door and cry until they give in. We can't refuse him anything. He is very loyal and loving... everyone should have a Pek-A-Tese at some point in their life!!! I brought my dog from Vietnam and all I know is he is a mixture but I can't tell what mix with what. I search for pekingese on Google image and "Hey, this one looks almost identical to my Kino." Yes, identical from the color of the ears, all lower teeth shown up, eyes, nose, etc. 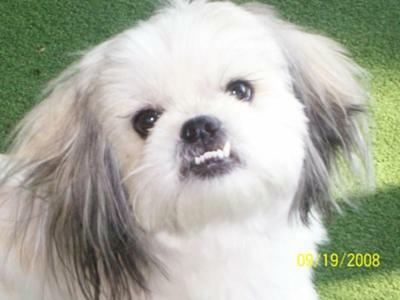 Now, I know my Kino is a Pekingese and Maltese mix. Thanks Dusty. You can see Kino's pictures on Facebook. P.S. Add my full name with a short message if you want to see how identical they are. Sorry I should have added that I got to meet the breeder that Dusty came from. They also own the pet shop where i bought him....I do agree with you that people should check out the breeders of any dog that you buy from a pet shop or pet show. There are so many people out there that just breed dogs for the profit and never stop to think about how the dogs feel or worry about their health. deplorable conditions the puppy's mother is probably living under. At least Dusty is saved. This is an updated picture of Mickey. He was 12 years old in this picture. He will be 13 in Sept. 2009. He is a Maltese Pekingese mix. We got him from a couple who could no longer care for him 8 years ago. 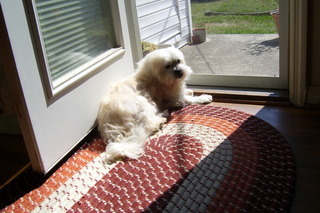 My Maltese Pekingese is a good watch dog and is so devoted and loving. He has always been well-mannered without jumping up on people that visit. He tells me he wants a Pupperoni treat or his food by staring at me with big eyes. He is our baby boy. All these mixed Maltese dogs are so cute and I enjoy seeing them. The people we got her from told us she was a teacup Maltese Pekingese mix. 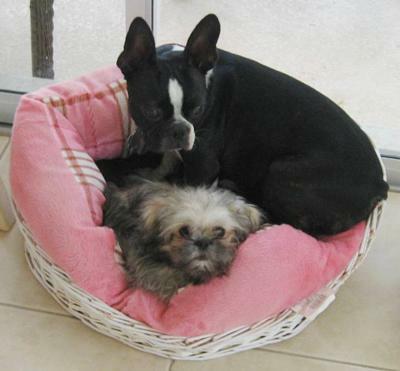 I was delighted to get her as a companion dog for our Boston Terrier. This little teacup grew and grew. She is now nearly one year old and weighs approximately 12lb. No way is she a teacup but we love her anyway. Our Pekingese mix just loves our Boston, and she has a really nice nature, also gets on with our two cats. She is a sweet little girl. My "teacup" Maltese/Yorkie isn't too small either. She is almost 5 mos. old and weighs about 5 lb.s She is golden colored and adorable, too. My daughter has a Boston Terrier, too. Cute dogs. How much did your little Muffin weigh at 6 mos.? That might give me an idea how big Muffit will be.